Hi friends! Boy, it's been a STRESSFUL day! Today started with about a billion people coming to our door to see the house b/c it went up for auction today. I DO NOT allow strangers into the house with the kids. Sorry people! The first guy came before 8am! Can you believe it?! I guess the house sold so we'll see what happens. I did however get to take a card class, more about that on Sunday. Onto the card. My friend Court Baker owns an awesome stamp company called Practicing Creativity. Her stamps are amazing quality and super cute! She has a few sketches over on her blog and I decided to plan along. I used Look Up from Practicing Creativity. The paper is Cosmo Cricket's DeLovely. The ribbon is from Joann Fabrics. Have a great night everyone! Also, check out my friend Jodi's BLOG CANDY, it is amazing!! I adore that floral balloon ... I need to break into that paper. This is so cute. I just love that set. LOVE the gorgeous balloon! Awesome job, Ashley! This is beautiful! I juts love those bright cheery colors! This is very pretty! 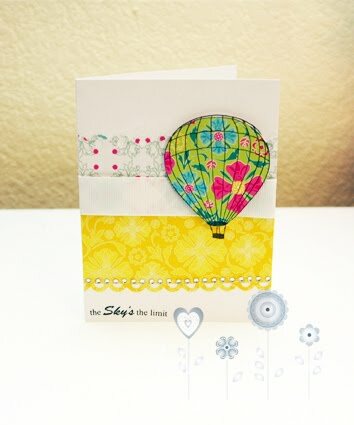 I love the paper you used on the hot air balloon! Great job with the sketch challenge!! Oh this is so super cute girl! Thanks for your kind words friend and for playing our challenge!